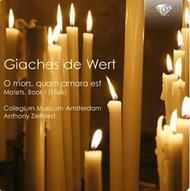 Born in 1536, Giaches de Wert represents the fifth and last generation of Franco-Flemish composers, although he in fact spent most of his working life in Mantua, where Duke Guglielmo di Gonzaga had appointed him maestro di cappella of the city's newly built basilica. Gonzaga was himself a talented composer, and his reason for commissioning this church was to do full justice both to liturgy and music, inspired by the ideals of the Counter-Reformation. Unsurprisingly, given the location of his career, De Wert's style is highly Italianiate, but it is also firmly rooted in the stately Franco-Flemish polyphonic tradition, and it is this combination of 'old' and 'new' (often within a single piece) that makes his 1566 motet collection 'Motectorum liber primus' - the subject of this release - so fascinating. Written for five or six (Adesto solori meo) voices, the set ranges from the 'oldest', almost entirely polyphonic, compositions to works in which there is a constant alternation between sections of counterpoint and choir en bloc, and pieces which are firmly rooted in the style of the Italian genre of the madrigal. Throughout the release, which is divided into three groups (prayers and admonitions; Old Testament texts; gospel narratives), word painting, harmony and structure coalesce to provide a programmatic backdrop to the text. Motets such as Transeunte Domino and Intravit Jesus, for example, are veritable historiae sacrae in which the music tells every small detail of the gospel story. Performing this music is Dutch vocal group Collegium Musicum Amsterdam, one of Europe's leading choirs and which recently marked its 75th anniversary. The ensemble's original focus was on 15th- and 16th-century repertoire of The Netherlands, but in recent years it has branched out to cover all manners of styles, including new music by composers such as Hendrik Andriessen. Here it appears under the directorship of Anthony Zielhorst, one of Netherlands ' leading choral conductors.